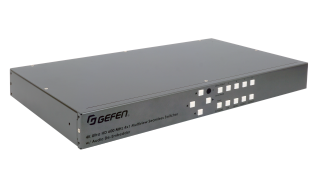 The What: Nortek Security & Control (NSC) is now shipping the Gefen 4K 600 MHz 4x1 Multiview Seamless Switcher (EXT-UHD600A-MVSL-41). The What Else: The 4K 600 MHz 4x1 Multiview Seamless Switcher switches and displays up to four sources individually or in various combinations on a single Ultra HD display. Its 4K HDMI 2.0 output ensures a high-resolution, pixel-to-pixel representation of each source on one screen in a quad-structure or other layout. Advanced seamless switching technology ensures no interruption of picture and no frame loss during source selection. Factory presets provide most commonly used arrangements of windows on a display, including single-window output. Additional programmable presets allow the user to store and recall custom-configured window arrangements. The 4K 600 MHz 4x1 Multiview Seamless Switcher is controllable via front-panel buttons, its handheld IR remote control, RS-232, and IP (web server interface, Telnet, and UDP). An intuitive on-screen graphical user interface simplifies system configuration, and its 1U tall enclosure features removable rack ears. It can be mounted in a standard 19-inch wide rack or conveniently be placed on a shelf. The Bottom Line: The 4x1 multi-view switcher is HDCP compliant, with support for input resolutions up to 1080p60 and output resolutions up to 4K60 4:4:4 (18Gbps, 600MHz TMDS clock). Audio from any of the four HDMI sources can be selected via IR, RS-232, or IP, for playback through the HDMI output and the L/R analog audio output. In addition, the analog audio is de-embedded from the HDMI output and can be routed to an outboard sound-reinforcement system, adding presence and impact to AV presentations.